Bob-Lo Island, located at southern end of the Detroit River before it enters Lake Erie, is about one half mile wide and three miles long. The native Wyandot called the island “Etiowiteendannenti,” and the early French settlers called it “Bois Blanc.” Both names refer to the “white wood” appearance lent by the birch and poplar trees that line the banks. The earliest historical reference, from 1718, describes 70 Native American families peacefully farming the fertile land. By 1742, a French mission “among the Hurons” was established. After 1796, British interests controlled the island and it was the staging point for the first local action in the War of 1812. A combined force of British and Native American soldiers in canoes surprised and overpowered an American vessel en route to Detroit. Soon after this, the British obtained the surrender of the American fort in Detroit without a shot being fired. Following the war, British forces garrisoned at Fort Malden in Amherstburg, across the river from Bois Blanc, and strengthened their position by building three blockhouses on the island. One of these survived to become a souvenir stand for the amusement park. The British also built a lighthouse in 1837 which operated until it was destroyed by vandals in 1954. Parts of that tower still stand. During the mid-19th century, the island was sold in parcels to several private owners who built cottages, stables, and trails. When opened as a park in 1898, the ferry company bought only a small portion of the middle of the island. Early success prompted increased acquisition, and the park eventually covered over 270 acres. 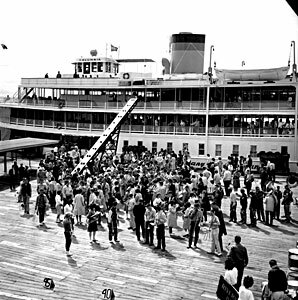 Bob-Lo Park was established as an entertainment destination in 1898 by the Detroit, Belle Isle and Windsor Ferry Company. In the beginning it was a picnic spot, with beaches, athletic fields, bicycle tracks, and a stunning Mangels-Illions carousel. Over the years it grew into a unique island amusement park, with a midway and dozens of rides. Millions of Americans and Canadians share memories of riding the Swan Boats or the train that circled the park. For more excitement there was the Whip, Wild Mouse, Tilt-a-Whirl, and Dodge’em Cars. For many people the best ride of the day was on the “Bob-Lo Boat” that took visitors to the island. Departing from the foot of Woodward, where Hart Plaza is now, the Columbia and Ste. Claire offered their own form of entertainment. After coming aboard, visitors could look down from the main deck into the engine room, where powerful shafts and cams slowly warmed up. Passengers often rushed upstairs to secure prime rail-side seats and await departure. The smell of hot dogs and popcorn mixed with dockside odors to heighten the experience. With a blast of the big steam whistle, lines were cast off, and the voyage began. The twenty mile voyage took about eighty minutes, and wound down the river past quiet marshlands and cottages lining the shore. Fresh breezes, lively music, and anticipation made the time fly by. Then after a long day of island fun, the ride home was a relaxing mix of memories, corny souvenirs, and great sunsets. 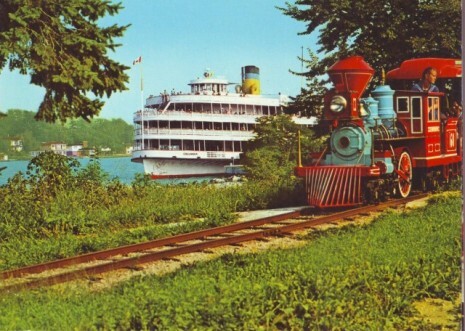 The classic boats stopped running in 1991 and the amusement park was shuttered after the 1993 season. Bob-Lo, however, lives on in the hearts of anyone who grew up in the Metro area and remembers the golden era of small amusement parks. In the years leading up to its closure, many of the rides were sold to satisfy debts. The 1878 Mangels-Illions Carousel’s forty four horses, two goats, and two deer were sold for more than $1 million. Many of the other rides are still entertaining guests at parks in Texas, Maryland, British Columbia, and Mexico. The island is now a residential community. 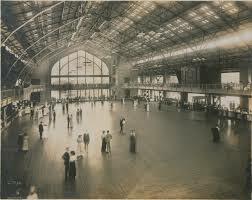 The dance pavilion built in 1913 was the largest in North America until 1925. Although adopted by generations of Detroiters, Bob-Lo has been part of Canada since 1787. During the 1920s and 1930s, swimming contests were held that went from Belle Isle to Bob-Lo, covering twenty four miles. The best time was 8 hours and 42 minutes turned in by 17-year old Dorothy de Caussin and 15-year old Ida Mutnick, both of Detroit. The park never occupied the whole island. Private cottages and government property remained at the north and south ends of the island. The park was closed for the 1933-1934 seasons due to the Great Depression. In 1958 the island was the site of joint Canadian-American war games, addressing a “hostile force presence” with amphibious units from around the Great Lakes. Bart, Homer and Marge Simpson greeted arriving guests in the 1990s. Several Detroit organizations held annual picnics on the island. Each year the largest gathering was sponsored by the St. Andrew’s Society of Detroit, which would often draw more than 10,000 visitors to their Scottish Games. Bob-Lo Park outlasted most other independent amusement parks. Notable local names include: Sugar Island closed in 1936; Eastwood Park, 1949; Tashmoo Park, 1951; Jefferson Beach, 1959; Walled Lake, 1968; Edgewater, 1981; Crystal Beach, 1989. This entry was posted in Detroit History and tagged 1920's, Amusement Park, Boblo Island, Bois Blanc, Downriver, history, jean scheffler, Michigan History, The Sugar House, Wyandotte. Bookmark the permalink.